Though the overall traffic environment in Pakistan is gradually getting better, the backward and less advanced urban zones in the country show precarious road conditions. Unfortunately, even in the posh areas with the modern traffic facilities, fatal road side accidents have become very frequent and indeed a routine matter. It is only because of the hasty, careless driving and inadequate knowledge of the road safety measures on the part of the drivers. When you observe negligence and show irresponsible attitude on the road, it is not only the life of others that you put to risk but also your own safety gets in danger. However, in the majority of the cases, it is you who fall victim to the follies of inconsiderate fellows. Discussed below are “Ten Best Road Safety Principles” which, if followed in true spirit, will render you safety to the utmost possible extent. So, stick to them to ensure safety not only for yourself but also your loved ones and the traffic crowd in general. Save others if you want to save yourself. It is a very bitter fact and an obvious traffic phenomenon that whenever something odd happens on the road, owing to anyone’s mistake, everyone on the way may get into trouble. It simply means that you may receive harm even if you don’t deserve it. That is why your own safety on the road is directly connected with the safety of others. So, don’t give others an opportunity to make a life-threatening mistake. It is better to reach the destination late than never at all. The proverb, “Hurry spoils the curry” finds its perfect application in the Pakistan traffic environment. In our society, when people are unable to manage time effectively, they usually make undue haste on the road. As a consequence, they happen to make some fatal mistake which often results in the loss of many precious lives. So, even if you are running very short of time, drive carefully and don’t bother about reaching the destination late. It will be far better than never reaching your office, home or any other desired place at all. Get well acquainted with the traffic rules. A little knowledge of anything, in most of the cases, proves to be a dangerous thing. So, don’t ever be content with the few driving tips you know and get sound knowledge of traffic rules before you actually put your vehicle on the congested roads. In this way, many future inconveniences can easily be averted, which might otherwise be just unbearable. Mind your speed while on the go. It is always very necessary on the part of the drivers that they observe speed limits as directed by the NHA (National Highway Authority) while going through the cities and uninhabited areas. The recommended speed limits are usually displayed on the guide posts installed at intervals along the roadside. However, if at some places these sign posts are missing, do sense the situation yourself and modify the speed accordingly. Always be mindful of precarious road conditions ahead. 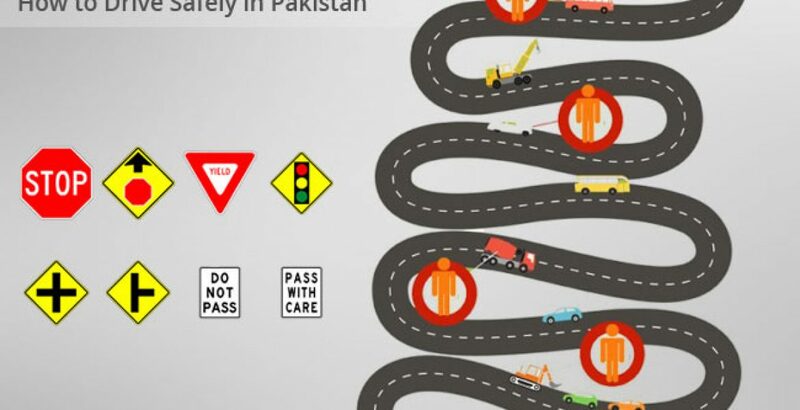 In Pakistani traffic environment, it has become an oft-witnessed phenomenon that roads are built on short terms basis which get broken soon after their construction. It is because the contractors make use of low quality material and faulty engineering techniques to save some extra money. The situation becomes even worse in cities where manholes are often left uncovered which not only cause obstruction in traffic flow but also result in unexpected incidents. So, it is necessary on the part of the drivers that they always remain mindful of the precarious road conditions ahead and manage the drive accordingly. Always keep the lights of your vehicle in order. Never turn a blind eye to the fact, “A stitch in time saves nine” and get the lighting system of your vehicles repaired as soon as it gets in disorder. In a country like Pakistan, which is facing acute energy crisis and extreme power shortage, you can never rely on the lamp posts installed along the roadside. While going on long routes in the pitch darkness, the best source of visibility are the lights of your own vehicle. For a safer driving, the indicators and signaling lights of your conveyance should also be in perfect shape. Always be mindful of the unruly road crossing public. Owing to the lack of awareness and carelessness observed by the general public crossing the road, these are the drivers who usually get in more trouble and have to avoid any unfortunate event. Being in too much haste, people just start crossing a road loaded with heavy traffic without looking around carefully. It is a common scene on roads passing through congested urban areas. So, you always need to be mindful of such dangerous circumstances. Report irresponsible driving of others to the concerned authorities. To ensure a peaceful and risk-free environment on the road, you must consider it your duty to report the irresponsible attitude of others to the concerned authorities. If such unruly and careless drivers go unchecked, along with their own, they will put the life of peace-loving travelers in danger. Ensure the health of your vehicle. Whether you are going for longer or shorter journeys always make sure that all the parts of your motor car are in perfect shape and working properly. Never trust the machine blindly and get it checked from a genuine mechanic before putting it to drive. In addition, take into account the over-heating of your vehicle, so that it does not break down anywhere on the road unexpectedly. Owing to an inborn instinct, we human often get involved in competition wherever possible—and sometimes even unknowingly! Keeping the drastic consequences in mind, you must avoid speeding or any kind of competition on the road. These are the simple and easy-to-follow principles which will make the traffic environment pleasant and conducive not only for you but also for others. You have to realize that your safety is in your own hands and life has been bestowed on you for the second time. Once you have put your vehicle on the road, a minor act of negligence will jeopardize the life of dozens or even hundreds of innocent individuals.